For other uses, see Toho (disambiguation). "Touhou" redirects here. It is not to be confused with Toubou people. The Touhou Project (Japanese: 東方Project, Hepburn: Tōhō Purojekuto, lit. 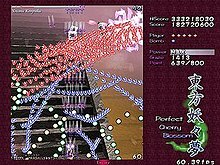 Eastern Project), also known as Toho Project or Project Shrine Maiden, is a series of Japanese bullet hell shooter video games developed by the single-person Team Shanghai Alice. Team Shanghai Alice's sole member, ZUN, independently produces the games' graphics, music, and programming. Plots in the Touhou Project games revolve around the strange phenomena occurring in Gensokyo, a fictional realm inhabited by humans and yōkai, supernatural beings. Prior to the events of the games, Gensokyo was sealed off from the outside world by a magical barrier. The main protagonist of the series is Reimu Hakurei, a shrine maiden who manages the border, fighting antagonistic yōkai. The first five games were produced for the Japanese NEC PC-9801 computer series; bullet hell mechanics were introduced in the second game, Story of Eastern Wonderland. The Embodiment of Scarlet Devil, released in August 2002, marked a shift to the Microsoft Windows platform, bringing the games to a larger audience. Several sequels followed, including spin-off fighting games that diverged from the series' traditional mechanics. The series was inducted into the Guinness World Records in October 2010 for being the "most prolific fan-made shooter series". The Touhou Project has spawned a media franchise including commercial fan books, music, light novels, manga, and several fanmade anime in addition to the main series. The Touhou series of games started on the Japanese PC-98 series of computers and its first five entries are native to that platform; standard PC users are only capable of playing them through an emulator. Also, the PC-9801 series of computers was already on the decline when these games were released. Because of this, they are not well known among players. The group that published these games was called Amusement Makers. The 1st game of the Touhou series, released in November 1996. It is not a vertical top-down shooter like most other games in the series, and is similar to Arkanoid instead. Reimu Hakurei, the perpetual protagonist, was introduced in this game. Reimu Hakurei enters through the gateway into another world, intent on locating and punishing the one responsible for destroying her shrine. Players direct a yin yang orb with amulets to break away blocks and the level is over once all of them are gone. If the player runs out of time on a level, bullets will rain down until the player completes the level or dies. Bosses are defeated by hitting the orb into them until their life is fully depleted. The 2nd Touhou game released in August 1997 at Comiket 52. This is the first danmaku game of the series, and also marks the first appearance of Marisa Kirisame (here as the second-to-last boss), the second major player character of the series. The resident shrine maiden Reimu Hakurei returns from a training session in the mountains only to find the Hakurei Shrine overrun by a contingent of ghosts and yōkai. Excited at the opportunity to test her fledgling abilities, she takes the powerful Hakurei Yin-Yang Orbs and takes off on the back of her turtle Genjii to seek out the source of the invasion. The gameplay is generally the same as Eastern Wonderland throughout the rest of the series. A two-player versus-type shooter similar to Twinkle Star Sprites, the game is labeled as the 3rd Touhou game, released in December 1997 in Comiket 53. Reimu Hakurei discovers that some mysterious ruins have suddenly appeared just outside the Hakurei Shrine. She joins in a violent competition with the other people who want to explore them—it is said that the one who reaches the heart of the ruins first will win a prize. The 4th game of the series, released in August 1998 in Comiket 54. This game introduces the focus mode, a staple of the series hereafter, that slows the sprite's movement to facilitate dodging bullets. Following the events of the previous games, the Eastern Country is once again at peace until yōkai begin to swarm the Hakurei Shrine and a tremendous power surges from beneath a lake high in the mountains. The shrine maiden Reimu Hakurei once again seeks out and eliminates the source of the disturbance - only, on this occasion, she is unwittingly joined by an old rival. According to ZUN, only 200 to 300 copies of the game were sold at the time. The game's title used the caption "Gensokyo", but the world's name is not used until The Embodiment of Scarlet Devil. The 5th and final Touhou game for the PC-98, released in December 1998 in Comiket 55. Mima and Yuka, final bosses of The Story of Eastern Wonderland and Lotus Land Story respectively, return as playable characters in this game. As so often is the case in Touhou games, something is amiss within the Eastern Country. A massive quantity of demons are pouring from a cave high within the mountains. Seeking the source of this invasion, Reimu Hakurei and others must travel through Makai to the one behind the problem. After Mystic Square, the Touhou Project became inactive for four years while its creator ZUN began to develop several music scores for the Seihou games. He then left the group and made Touhou games for Windows under his own group, Team Shanghai Alice. The playability of the Windows games was substantially improved compared to that of the PC-98 counterparts. Most dōjin works derived from the Touhou series are centered on these games. The 6th Touhou game and the first on Windows. It greatly exceeded the PC-98 games graphically, switched from FM Synthesis to synthesized PCM music (with simplified MIDI as a fall-back), and was the first game to gather a substantial Western fanbase. The story, set in the 118th season, told by conversations between characters during interludes in the action, goes as such: the land of Gensokyo (setting of all the Touhou games) has been engulfed by a scarlet mist, and its inhabitants no longer see the sun. As the shrine maiden Reimu Hakurei or the witch Marisa Kirisame, the player attempts to deal with the source of the mist, a mysterious figure called the Scarlet Devil. The 7th Touhou game. It is unusual among the recent releases in that the English and Japanese titles are not similar in meaning; its Japanese title could be rendered as Bewitching Dream. As the month turns to May, winter has lasted far longer than normal in Gensokyo, and the denizens begin to suspect foul play. As Reimu, Marisa, or the new arrival Sakuya Izayoi, the player embarks in the 119th season on a search for those who are working to prevent spring's coming. Perfect Cherry Blossom continues the tradition of the Touhou games, with the reappearance of former bosses as playable characters. Immaterial and Missing Power was produced in collaboration with Twilight Frontier, and is the 7.5th Touhou game in the series. Despite being released after Imperishable Night, it is numbered 7.5 because the events in this game took place before those of Imperishable Night. Immaterial and Missing Power is a 2D fighting game instead of the usual scrolling shooter. Though Team Shanghai Alice was only responsible for the storyline and some of the music, the game was listed as one of the team's official works. Initially playable characters in this game include some of the characters from previous Windows games, such as the two protagonists Reimu Hakurei and Marisa Kirisame, Alice Margatroid, Youmu Konpaku (both bosses from Perfect Cherry Blossom), Sakuya Izayoi and Patchouli Knowledge (both bosses from Embodiment of Scarlet Devil). More characters become playable as the player finishes the story mode with the initially playable characters, and so on. An official patch to the game adds Hong Meirin (from Embodiment of Scarlet Devil) as a playable character, but she is not available in the story mode. Set within the 119th season, it is about the Hyakki Yagyou that happens once every 3 days. The 8th Touhou game. It was released at the Comiket 66 Convention in August 2004. This story's focus is on a rather more insidious evil than past games. Gensokyo's yearly event, the Moonviewing Feast, is only one dawn away, but someone seems to have replaced the moon with a fake that will not grow full. A team of human and yōkai set out to remedy this before the night is over. In this entry, each of the usual playable characters gets a teammate from the non-human side of Gensokyo. Reimu Hakurei allies with Yukari Yakumo, Yōkai of the Boundary; Marisa Kirisame with Alice Margatroid, the Seven-Colored Puppeteer; and Sakuya brings her mistress, Remilia Scarlet. The new team is half-ghost Youmu Konpaku and full-ghost Yuyuko Saigyouji, Stage 5 and Final bosses of Perfect Cherry Blossom respectively. All the other characters (except Remilia) appeared in Perfect Cherry Blossom. The 9th Touhou game. It was released in August 2005 at the summer Comiket 68 convention. This game is a versus-type shooter like Phantasmagoria of Dim. Dream, and has very different gameplay from the past three entries in the series. Set within the 120th season, the story puts the characters in an investigation on why the flowers of Gensokyo are blooming out of season and more than usual, an incident said to occur every 60 years. Initially playable characters include Reimu, Marisa and Sakuya as usual (as well as two other characters from previous games), but the list adds on as the player progresses in the storyline of each of the players. The 9.5th game in the series. It was released at the Comiket 69 convention in December 2005. The game is meant to be the game version of the official fanbook, Bohemian Archive in Japanese Red. The player, as tengu reporter Aya Shameimaru, is tasked with taking pictures of bosses for her newspaper to clear successively more difficult stages. The game is unique in that the player has no standard shot or bombs; rather, the camera is the main method of offense and defense as it clears bullets from the screen. Scoring is based on the contents of each photo, boss location, number of bullets, and Aya's position. Notably, this is one of only three games in which Reimu Hakurei is not a playable character—in fact, she does not even appear as an enemy. The 10th Touhou game. It was announced in early May 2007, and a trial version was released at the Reitaisai 4 convention on May 20, 2007. The full game was released on the first day of Comiket 72, August 17, 2007. Reimu receives an order to close down the Hakurei Shrine, or it will be torn down and the god of Yōkai Mountain will take it over. As either Reimu or Marisa, the player has to ascend to the top of Yōkai Mountain to find the god behind the happenings and prevent the shrine from being taken over. The second versus fighting game similar to Immaterial and Missing Power and the 10.5th Touhou game by Team Shanghai Alice and Twilight Frontier. It was released on May 25, 2008. The storyline in the game revolves around the strange weather patterns occurring around Gensokyo and as the characters are chosen in the game, they must find out who is controlling it. This is the first game to introduce the card deck system and changing weather conditions that affects the gameplay during matches. The 11th Touhou game. It was announced on May 1, 2008. A demo was released at the Reitaisai 5 convention alongside the full version of Scarlet Weather Rhapsody. The full version was released on August 16, 2008 at Comiket 74. A mysterious geyser appears one day near the Hakurei Shrine, which also seems to spout evil spirits from underground. Reimu or Marisa go underground with the help of one of three yōkai (Yukari Yakumo, Suika Ibuki, or Aya Syameimaru for Reimu; Alice Margatroid, Patchouli Knowledge, or Nitori Kawashiro for Marisa) and stop the source of the geyser before things get far too out of hand. The 12th Touhou game. It was announced on February 26, 2009. A demo was released at the Reitaisai 6 convention on March 8, 2009, and the full version was released on August 15, 2009 at Comiket 76. Spring has come to Gensokyo and a magical flying ship that is said to bring good omen has appeared in the sky. The player assumes the role of either Reimu, Marisa, or Sanae Kotiya, who returns from Mountain of Faith, as the three girls race to board the vessel. While the separate bomb counter is back, the scoring system gets complemented by the "Undefined Fantastic Objects", or UFOs, that appear as traditional unidentified flying objects in three colors (green, red and blue) and must be collected in groups of three in order to get different bonuses. The third versus fighting game and the 12.3rd Touhou game done by Team Shanghai Alice and Twilight Frontier. It was announced on July 23, 2009, and was released at Comiket 76 on August 15, 2009. The game introduces new spell cards and weather conditions as well as improved gameplay. Characters from Scarlet Weather Rhapsody can be played in versus mode if that game is installed. The story mode, which is playable with Sanae Kotiya, Cirno, and Hong Meirin, revolves around the silhouette of a giant creature, which piqued the interest of the denizens of Gensokyo. Both Sanae and Cirno's scenarios involve the investigation of the strange being and to find out who is controlling the strange giant. Meirin's scenario involves fighting a strange being in a dream who wanted to destroy the world. This is the only Touhou game in the series to not have an official English subtitle. The 12.5th game in the series announced by ZUN on March 3, 2010. The game was released on March 14, 2010 at the Reitaisai 7 convention. The game focuses again on Aya Shameimaru and is meant as a sequel to Shoot the Bullet as it has a same gameplay style but adds new characters and spell cards, covering all characters from Mountain of Faith onwards. The 12.8th game in the series announced by ZUN on July 23, 2010. The game is the continuation of the Touhou Sangetsusei manga series and was released at Comiket 78 on August 14, 2010. Cirno is the main character of the game and the gameplay is focused on vertical shooting with the inclusion of the ability to freeze bullets. The 13th game in the series. It was announced on February 28, 2011. A demo was slated for release at the Reitaisai 8 convention on March 13, 2011, however, the trial release was temporary canceled due to the Tōhoku earthquake. The full game was released at Comiket 80 on August 13, 2011. Reimu, Marisa, and Sanae are once again playable as they were in the latest main installment in the franchise Undefined Fantastic Object joined by Youmu Konpaku as a fourth playable character. In this game, Reimu and Marisa notice an increase in divine spirits and take off to investigate. Sanae seeks to utilize the power of the divine spirits for the Moriya Shrine gods, and Youmu Konpaku wants to exterminate all ghosts that are not under her right. The 13.5th game in the series, and the fourth versus fighting game created by Team Shanghai Alice and Twilight Frontier. It was announced on October 5, 2012. The game features a completely different style of 2D sprites compared to the earlier fighter games. A demo was released at Comiket 83 in December 2012, and the final version of the game was released at Reitaisai 10 on May 26, 2013. In this game, the inhabitants of the Human Village lose hope, and the characters use religion to try to ease their minds. The 14th game in the series, which was announced by ZUN on May 11, 2013. A trial version of the game was released at Reitaisai 10 on May 26, 2013 and the full version was released at Comiket 84 on August 12, 2013. On August 10, 2014, the game was confirmed for release on Playism, making Double Dealing Character the first Touhou Project game to be released for digital download. On May 7, 2015, Playism made the game available for download in western territories, marking Touhou Project's official Western debut. Reimu and Marisa are once again playable and Sakuya is now a playable character for the first time since Phantasmagoria of Flower View. The story revolves around the yōkai rioting all over Gensokyo and the individual weapons of the three protagonists starting to act oddly. It is their job to either take their weapons in hand and fight the yōkai, or to cast their weapons aside. The 14.3rd official game in the series, was announced on April 12, 2014, and was released at Reitaisai 11 on May 11, 2014. It was released on Steam on April 1, 2019. The game is a danmaku type that deviates from the usual play style, and involves the player controlling the culprit of the previous game, Seija Kijin, who uses a series of cheat items to clear spell cards. A bounty is set on Seija, and several characters from previous games attempt to capture her. The 14.5th official game in the series, and the fifth versus fighting game created by Team Shanghai Alice and Twilight Frontier. It was announced by ZUN at the Digital Game Expo 2014 on November 16, 2014 and released on May 10, 2015. Urban Legend in Limbo was also released for PlayStation 4 on December 8, 2016 with several new features, including the addition of Reisen Udongein Inaba as a playable character. This makes the game the first in the series to be released on a gaming console. 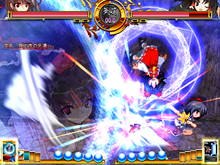 The game features a similar style and gameplay to the previous Touhou fighting game Hopeless Masquerade. The game art is by Moe Harukawa, and was announced alongside another minigame by ZUN titled Danmaku Amanojaku Gold Rush. The 15th game in the series, which was announced by ZUN on April 22, 2015. The game features four playable characters: Reimu, Marisa, Sanae, and Reisen. It was released on August 14, 2015. It was released on Steam on April 1, 2019. In this game, someone takes over the Lunar Capital, which causes Lunarians to try to move to Gensokyo and purify it. Unlike previous games in the series, Legacy of Lunatic Kingdom has two game modes: Legacy Mode, which is similar to the previous games, and Pointdevice Mode, a gameplay mode where lives and continues are removed, but checkpoints are added. When the player gets hit in this mode, they restart from the beginning of the current chapter with a small penalty to power. The 15.5th official game in the series, and the sixth versus fighting game created by Team Shanghai Alice and Twilight Frontier. It was announced on December 11, 2016. The first trial version was released at Reitaisai 14 on May 7, 2017, and the second was released at Autumn Reitaisai 4 on October 15, 2017. The game was released on Steam on January 5, 2018. The 16th official game in the series, announced by ZUN on April 20, 2017. A playable demo was released on May 7, 2017, at Reitaisai 14, and the full version was released at Comiket 92 on August 11, 2017. On November 16, 2017, the game was released for download on Steam, marking Touhou's official Steam debut. The seasons are out of whack as meadows are alongside winter blizzards, fall trees, and sunny skies. Reimu, Marisa, Aya, and Cirno go out to find the cause of this chaos. The game has a sub-season mechanic where they collect the seasons in order to gain boosts to the protagonist's shots, depending on the sub-season of the player's choosing . They can also release their collected season to clear a portion of the screen of enemy projectiles. The 16.5th official game in the series, released on August 10, 2018. A danmaku photography game in the style of Shoot the Bullet and Double Spoiler, but with Sumireko Usami as the playable character. The 17th official game in the series, announced by ZUN on April 17, 2019. A demo is planned to be released on May 5, 2019 at Reitaisai and the full version is planned to be released in mid-2019. Animal spirits from Hell plan to attack the surface world; Reimu, Marisa and Youmu team up with friendly animal spirits to try to stop them. In addition to dōjin games, Team Shanghai Alice has also expanded the Touhou universe into other media. Ten music albums have been released by ZUN, each containing rearranged versions of music from the games, in addition to original tracks. These albums are Dolls in Pseudo Paradise (蓬莱人形), Ghostly Field Club (蓮台野夜行), Changeability of Strange Dream (夢違科学世紀), Retrospective 53 minutes (卯酉東海道), Magical Astronomy (大空魔術), Unknown Flower, Mesmerizing Journey (未知の花　魅知の旅) (5.5th), Trojan Green Asteroid (鳥船遺跡), Neo-traditionalism of Japan (伊弉諾物質), Dr. Latency's Freak Report (燕石博物誌) and Dateless Bar "Old Adam" (旧約酒場). Each CD also comes with a bonus story about Secret Sealing Club (秘封倶楽部, Hifuu Kurabu) except the first and the 5.5th one. 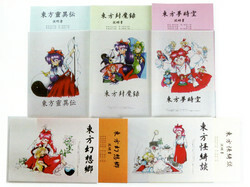 There is also a five-volume set of soundtracks containing music from the PC-98 Touhou games titled Akyu's Untouched Score (幺樂団の歴史), in addition to original game soundtracks for Immaterial and Missing Power, Scarlet Weather Rhapsody, Touhou Hisōtensoku, Hopeless Masquerade and Urban Legend in Limbo. Some of the official print media released include music CDs containing original tracks and rearranges of earlier music. Written by ZUN himself, Curiosities of Lotus Asia is a story published in installments. First it was published in the Colorful Puregirl magazine, but was moved to Magazine Elfics of the BiBLOS company after the discontinuation of the former. However, as BiBLOS went bankrupt, the series was moved again. Finally, it was published in the magazine Dengeki Moeoh between the August and December 2007 issues. In addition, some installments of Curiosities of Lotus Asia were published on the Elnavi website. A compilation was released on September 30, 2010 by ASCII Media Works. In 2015, a continuation of the series was featured in the Touhou-only magazine Strange Creators of Outer World. The protagonist Rinnosuke Morichika is the only humanoid male character shown in Touhou. The main subject of this publication is about Kourindou (香霖堂), an old tool shop run by Rinnosuke. Touhou Sangetsusei is a manga being published in Comp Ace. The story centers around three fairies and their daily mischiefs, adventures, and chance meetings. The base story is written by ZUN, and the art is drawn by selected dōjin manga artists. The first part, Eastern and Little Nature Deity, is drawn by Nemu Matsukura. Starting May 2006, Matsukura stopped drawing the manga for health reasons, and that responsibility was given to Makoto Hirasaka, who became the sole illustrator of Touhou Sangetsusei henceafter. Thus a second version of Touhou Sangetsusei is published, titled Strange and Bright Nature Deity. In January 2009, Strange and Bright Nature Deity ended and was replaced by the third part, titled Oriental Sacred Place in May 2009. The game Fairy Wars, released on August 14, 2010, is a spinoff of the manga. In January 2016, Touhou Sangetsusei continued with the fourth version, Visionary Fairies in Shrine, after a four-year hiatus since the end of Oriental Sacred Place. Bohemian Archive in Japanese Red is the official fanbook of the Touhou series. The book includes mock newspaper articles by Aya Shameimaru, an interview of ZUN, and a compilation of some dōjinshi. A CD-ROM is attached to the back cover, and in it are new music tracks by ZUN, a demo of Phantasmagoria of Flower View, and a wallpaper of the book's cover. Prominent within this book is the usage of an alternate calendar system called the "Youkai Lunisolar Calendar." Seasonal Dream Vision is an anthology of dōjinshi published by Comic Toranoana. Also included is ZUN's short story related to Phantasmagoria of Flower View and a CD of various rearrangements of his music. Perfect Memento in Strict Sense is a guide and bestiary of Gensokyo, as told by Hieda no Akyu. It was released in late December 2006, published by Ichijinsha, but was originally slated for August of that year. A manga that uses the story's premise is published in the December 2006 issue of the Comic Rex magazine. It is about a fictional "Gensokyo Chronicles" that Akyu supposedly published in Gensokyo in the 121st season. Touhou Bōgetsushō is a continuation of the story from Imperishable Night. It consists of a manga, a novel, and a yonkoma serialized in three Ichijinsha magazines. The manga Silent Sinner in Blue began serialization in the Comic Rex magazine in the July 2007 issue. Drawn by Aki-Eda, the manga focuses on the human characters Reimu and Marisa. The novel Cage in Lunatic Runagate was serialized in the quarterly Chara-Mel magazine, debuting on June 25, 2007. It is illustrated by Tokiame, and the plot being a deep submersion into the manga, taking a non-human perspective. Finally, the yonkoma The Inaba of the Moon and the Inaba of the Earth (月のイナバと地上の因幡, Tsuki no Inaba to Chijō no Inaba), illustrated by Arata Toshihira, is a light-hearted discursion from the main story, featuring Reisen and Tewi Inaba. It debuted in the August 2007 issue of the Manga 4-koma Kings Palette magazine, which was sold on June 22, 2007. Grimoire of Marisa is a book purported to be Marisa Kirisame's notebook recording the noteworthy spell cards that she has encountered. It is written by ZUN and illustrated by Takeshi Moriki for the contents and Genji Asai for the cover. It was published in July 2009. Wild and Horned Hermit is a manga which started serialization on July 24, 2010 in volume one of Ichijinsha's Chara Mel Febri. Written by ZUN with art by Aya Azuma, it introduces the new character Kasen Ibara. Symposium of Post-mysticism is a book written by ZUN and illustrated by Masakichi, Tokiame, Azuma Aya, Masatoki Asakura and Kitsune, and was released on April 27, 2012. The contents cover information of almost every Touhou character from Mountain of Faith to Ten Desires, in addition to a series of mock newspaper articles from the Bunbunmaru Newspaper and Kakashi Spirit News explaining aspects of Touhou lore. Forbidden Scrollery is a manga series written by ZUN and illustrated by the young female artist Moe Harukawa. It debuted in the December 2012 issue of Comp Ace. It received an official English-translated release by Yen Press. Strange Creators of Outer World is an official Touhou-only magazine published by ASCII Media Works and supervised by ZUN. It features interviews with ZUN and other Touhou dōjin creators, a continuation of Curiosities of Lotus Asia, and manga by dōjinshi artists. The first issue was released on September 30, 2015. Alternative Facts in Eastern Utopia is an official Touhou book released on March 30, 2017. It is presented as Aya Shameimaru's attempt to create a tabloid magazine in the style of those from the outside world, which she eventually cancelled and left unpublished. The book features in-universe articles, interviews and advertisements similar to the earlier Bohemian Archive in Japanese Red, but in a significantly more chaotic and haphazard format. In the shooting games, the player's bullet power increases on a linear scale as the player collects power-ups dropped by enemies, and eventually maxes out. The player can also collect 'point' icons to earn extra lives; the amount needed grows exponentially as the player's score rises. The player can use 'focus', the shift key by default, which slows down the player's movement, makes the collision box visible, and (generally; some characters are reversed) focuses the player's attack to make it more powerful. The graze counter, missing from Mountain of Faith and Story of Eastern Wonderland, tracks how many bullets entered the character sprite but avoided the collision box, and rewards the player with a score bonus for living on the edge. The player can use a weapon called a 'spell card', which is similar to a 'bomb' in most other shooting games. While the player has a limited number, using one makes the user temporarily invulnerable and uses a special magical attack that generally clears the screen. Each character has two cards with different names and patterns. The player can use one during a short period after being hit by a bullet (known as the 'border between life and death') to avoid loss of a life. The amount of time the player has available to use the border is usually around 0.3 seconds. Bosses also have spell cards, but with bosses the term applies to a prolonged pattern of movements and shots that lasts until the player depletes the boss' health by a certain amount or the time runs out, not a one-shot attack. Each individual game of the main series from Perfect Cherry Blossom to Ten Desires has additional items that affect some aspect of gameplay, such as scoring or gaining extra lives/bombs. For example, Perfect Cherry Blossom has "cherry points", which are used mostly in scoring, but can grant temporary invulnerability (known as 'supernatural border'); Imperishable Night has "time points", which are essential for advancing to later stages, and also determine if the player gets to challenge a boss's 'final spell' on normal or higher difficulties; Mountain of Faith has 'faith' points, which boost the score the player receives upon gathering point items and bonuses for clearing spell cards without dying or using a spell card. Each Touhou game has four difficulty levels—easy, normal, hard, and lunatic—with each one being harder than the previous one. Regardless of difficulty choice, there are six stages in each game and each one is harder than the previous. The only exceptions to this are Story of Eastern Wonderland, and Embodiment of Scarlet Devil on easy difficulty, both of which only have five stages. In addition to the four main difficulties, there is an extra stage which is a long and difficult stage in which players must play through hordes of enemies, and an especially long boss fight (usually with ten spell cards). In order to reach the extra stage, one must beat the game on normal difficulty or higher without the use of a continue. The only games that allow players to reach the extra stage by completing the easy difficulty are Story of Eastern Wonderland, Mystic Square, Perfect Cherry Blossom, Imperishable Night, Fairy Wars, Double Dealing Character, and Legacy of Lunatic Kingdom. In terms of difficulty, the extra stage is around the normal difficulty level or above. In Perfect Cherry Blossom, there is also a phantasm extra stage in which the enemies that were already difficult in the extra stage have become even more challenging. Although the phantasm stage is aimed for the most experienced players, the difficulty is somewhere in between hard and lunatic. The phantasm stage is accessed by beating the extra stage and capturing at least 60 spells with any of the characters and weapon types combined. The plots of the Touhou Project revolve around the strange phenomena that occur in the fictional realm of Gensokyo (幻想郷, Gensōkyō, literally Fantasy Village or Fantasy Land), which ZUN designed with a human village in the grounds of some remote mountain recesses in Japan. Originally, it was simply called "a remote separated land of a human village in an eastern country." Long before Touhou Project's story begins, there lived many non-humans like yōkai as well as some humans in the area. After a few humans lost their way into Gensokyo, humans became afraid of approaching this area, although others settled here for the sake of yōkai extermination. However, as time went on, humans developed civilization and multiplied in number, and thus the yōkai became distressed about how this would affect the balance between humans and yōkai. Thus, 500 years before The Embodiment of Scarlet Devil (EoSD), the yōkai sage Yukari Yakumo developed the "boundary of phantasm and substance," which was favored by the yōkai and protected the balance. This was called the "Yōkai Expansion Project" and made Gensokyo a phantasmal world that automatically called out to the weakened yōkai of the outside world. Other things that disappear from the outside world, like extinct animals, lost tools, and architecture, also became abundant in Gensokyo. Since Gensokyo was a plot of land in Japan that was separated by a barrier, it is Japan that is immediately outside of this barrier. As a result of the seal, Gensokyo became inaccessible from the outside world, and similarly, those in Gensokyo were unable to leave. Gensokyo's existence could not be confirmed from the outside world, nor could the outside world be confirmed within Gensokyo. As a result, the isolated community developed its own civilization, different from that of the outside world. Although separated by a barrier, it is a bordering world to its outside, as opposed to being in a parallel universe. There are no seas in Gensokyo, since it is an inland mountain. In Gensokyo, there are few humans, and various kinds of yōkai. Some species include magicians, beasts, therianthropies, vampires, bōrei, tengu, mermaids, kappa, and yōkai (a kind of miscellaneous group). There are others species that could be yōkai depending on definition, like fairies, spirits, yūrei, onryō, poltergeists, hermits, oni, and gods. In present Gensokyo, which is presented in all Touhou Project games since EoSD, as opposed to the outside world where unscientific phenomena were dismissed as "superstition" by the time of the Meiji era, magical and spiritual qualities prevail. The only known gateway from the outside world into Gensokyo is the Hakurei Shrine on the border of Gensokyo. The spell card rules were also established to keep up the relationship between humans and yōkai in a mock style, which was necessary for the preservation of the balance of Gensokyo. The "Great Hakurei Barrier," managed by Hakurei Miko, was constructed several decades before EoSD, which is described as a "barrier of common sense," and is thus a strong logical barrier that not even yōkai can pass through. The yōkai were at first against its construction, but then gradually understood its usefulness. In Gensokyo, events called "incidents" occur once in a while. An incident is an event that affects all of Gensokyo and is of unknown cause at the time it occurs. Touhou Project mainly focuses on incidents in its stories, but there are also works like Mountain of Faith that are about events other than incidents. Frequently, incidents are due to a yōkai's whim or curiosity, and usually Reimu Hakurei would go to investigate it and then find and chastise the perpetrator. Usually, the shrine maiden of the Hakurei Shrine resolves incidents, but there are cases where Marisa Kirisame and other imitators would resolve them. When a major incident occurs, the spirits and fairies are affected by the circumstances, the incident, and the perpetrator, and experience an increase in power for the duration incident, so there are also cases where a mere fairy defeats Reimu. It has additionally been stated that people of the village also go out to resolve incidents. With its focus on bishōjo characters, the Touhou series possesses a large cast compared to other shooting games. While they aren't developed nearly to the standards of a story-based game, many players love them, and even obscure stage bosses who only appear once have a fanbase. One example is Hong Meiling, affectionately known as Chūgoku (China), the stage 3 boss of The Embodiment of Scarlet Devil, who won a popularity contest in Japan out of all Touhou characters. Among the vast array of characters, only six named characters are male. One (Genjii) is a turtle, one is a cat (Sokrates), two (Youki Konpaku and Myouren Hijiri) are only mentioned in passing, one (Rinnosuke Morichika) is only featured in the serialized novel, and the last (Unzan) is a cloud-like entity. There is also one before all these (Shingyoku), but this character has three forms of different genders, so this character may not exactly be male. Though each game features a collection of different characters, the main protagonist of the series is always Reimu Hakurei, joined by Marisa Kirisame after the second game. Exceptions to this include Shoot the Bullet and Double Spoiler (Aya Shameimaru is playable on both, and Hatate Himekaidou can become playable in Double Spoiler); Fairy Wars (which has Cirno as the sole playable character); Impossible Spell Card (where only Seija Kijin is playable); and Violet Detector (where only Sumireko Usami is playable). The Touhou Project is a one-man project by a Japanese game maker, Jun'ya Ōta (usually under the pseudonym ZUN), who does all the graphics, music, and programming alone for the bullet hell games, with the exceptions of the portrait art in Fairy Wars, which is by Makoto Hirasaka, and the fighting games, Immaterial and Missing Power, Scarlet Weather Rhapsody, Touhou Hisōtensoku, Hopeless Masquerade, and Urban Legend in Limbo, which were dual efforts with Twilight Frontier. The idea of Touhou first came to ZUN during his high school years, when shrine maiden-themed games were in the minority. "It would be nice to make shrine maiden games," he thought, and often imagined the music that would go with such games. He went to college, hoping to compose music for fighting games, since they were popular at the time due to Street Fighter II. However, he decided that in order to put his music into games, it would be easier to make his own game to go with it, thus the first Touhou game, Highly Responsive to Prayers, was released in 1996. The first game was originally intended as a practice in programming. Touhou only became a shooting game series starting from the second game, because the popularity of shooting games had revived due to RayForce and ZUN had long been a fan of such games. ZUN remarked how the general theme and direction of Touhou only started coming together in the sixth game, Embodiment of Scarlet Devil. ZUN develops his games with Visual Studio, Adobe Photoshop, and Cubase, according to his interview in Bohemian Archive in Japanese Red. A graph comparing the participation of dōjin circles at Comiket 85 (December 2013). A prodigious number of derivative works based on Touhou have been created since the release of Embodiment of Scarlet Devil. These include dōjinshi, dōjin music, dōjin anime, and dōjin games (even though the Touhou games themselves are dōjin games). The vast scope of Touhou derivatives prompted commentary, noting that Touhou Project became an unmissable aspect of Japanese consumer generated media. These dōjin activities are mostly responsible for adding original attributes to characters that ZUN may not have intended. ZUN, for the most part, had acknowledged, appreciated, and even encouraged these derivative works by imposing very few restrictions on the use of his works. The major restrictions are on unauthorized commercial distribution (as opposed to dōjin) and the spoiling of endings; proper attribution to Team Shanghai Alice is a recommendation. ZUN stated himself that he did not want the Touhou Project game series to be officially commercialized. The first recent publication of Touhou derivative doujinshi occurred during December 2003, following the release of Perfect Cherry Blossom; seven circles sold Touhou derivative works at Comiket 65 in December 2003. At the Comiket 74 in August 2008, a total of 885 circles had Touhou derivative works on display or for sale, out of a total of 35,000 circles participating at Comiket. At Comiket 77 (December 2009), 2,372 circles were dedicated to Touhou, breaking the previous record held by The Prince of Tennis at Comiket 66 (August 2004), which had 2,130 circles. At Comiket 85 (December 2013), Touhou was still in the lead, with 2,272 participating circles selling Touhou derivatives, far outpacing those of other franchises. The dōjin games based on Touhou include adaptations of other game series' mechanics with Touhou characters, such as Super Marisa Land and Super Marisa World (parodies of the Mario games with the titles being a play on Super Mario Land and Super Mario World, respectively), MegaMari (based on the Mega Man series), and Touhou Soccer (based on the Captain Tsubasa games by Tecmo). The music of Touhou is also very popular and many arrangement CDs can be found for sale at Comiket and other Japanese conventions. At Tokyo Game Show 2014, ZUN announced a collaborative project with PlayStation bringing unofficial, fan-made Touhou Project dōjin games to the PlayStation 4 (PS4) and PlayStation Vita platforms. As of September 2014, Fushigi no Gensōkyō 3 (不思議の幻想郷3) by Aqua Style, Touhou Aogami Engi: The Genius of Sappheiros (東方蒼神縁起) by Strawberry Bose and Touhou Sky Arena Matsuri (東方スカイアリーナ祭) by Area-Zero have been announced for release on the PS4. The games will be published by Mediascape, under contract by Sony Computer Entertainment and ZUN, as part of a move towards embracing indie games for commercial distribution on PlayStation platforms. Among the most popular derivatives are the series of Flash videos created by the dōjin music circle IOSYS. Many of them, one of which is "Marisa Stole the Precious Thing," are popular on otaku internet forums and Nico Nico Douga. The original "Yukkuri shite itte ne!!!" Shift JIS art. A major internet meme based on Touhou is "Yukkuri shite itte ne!!!" (ゆっくりしていってね!! !, often translated as "You should be taking it easy!!! "), which centers around the disembodied, deformed heads of Touhou characters, often referred to as "yukkuris". This meme originated from a disfigured attempt to draw the main characters Reimu and Marisa with Shift JIS art. Yukkuris became so popular that the phrase "Yukkuri shite itte ne!!!" won bronze for 2008's "Net Slang of the Year" in Japan. Yukkuris also appear in Internet advertisements, the anime Natsu no Arashi! and Pani Poni Dash!, and most notably, the front page of 2channel, the largest Internet forum in the world. Yuyuko Saigyouji and Reimu Hakurei also make cameo character appearances in Square Enix's game Lord of Vermilion Re:2. A short derivative animated project, Anime Tenchou x Touhou Project (アニメ店長 x 東方Project) was produced by Ufotable in celebration of the 10th anniversary of Japanese goods chain Animate as a promotional video for the store combining the world of Touhou with Animate's mascot, Meito Anizawa. Several fanmade anime have also been made for Touhou. A dōjin anime project by the dōjin circle Maikaze, titled A Summer Day's Dream (夢想夏郷), is a fan-made anime adaptation with an original plot featuring Touhou characters, with four episodes released from 2008 to 2016, and the 2.5th episode released in 2014; the last episode will be released in 2020. Albeit created by an amateur studio, the project featured professional voice actors. Another dōjin anime by the circle Manpuku Jinja, titled Fantasy Kaleidoscope ~ The Memories of Phantasm (幻想万華鏡) (without voice dubbing but have background music and sound), was released at Comiket 80 in 2011, with one episode released based on the storyline of Perfect Cherry Blossom, and there are 12 episodes as of 2019. Kyoto Fantasy Troupe, a Chinese dōjin circle, made a dōjin anime titled Hifuu Club Activity Record ~ The Sealed Esoteric History (秘封活动记录). The first episode was released at Comiket 89 in late 2015 and Chengdu TouhouOnly05 in early 2016, and it also featured professional Japanese voice actors when it was released again later. The second episode was released in 2017. Another Chinese dōjin circle, Perpetual Motion Niche, is also making a dōjin anime titled Secluded Magic Instrument~ Meteors of Triple Dimension (幽幻天仪盘), which is about the story of the collision of three worlds——the forgotten Eastern Country (in the PC-98 games), Gensokyo (in the Windows games) and the outside world; the first episode was released in Q3 2017. The Touhou Project was nominated for the 11th annual Media Arts Awards held by Japan's Agency for Cultural Affairs, under the Entertainment category, where Touhou Project eventually lost to Nintendo's Wii Sports for the Grand Prize award. The Hakurei Shrine Reitaisai (博麗神社例大祭, Hakurei Jinja Reitaisai, Hakurei Shrine's Regular Grand Festival) is the largest of the many dōjin conventions hosting only Touhou content. Although the coordinator of this convention has nothing to do with Team Shanghai Alice officially, the name "Hakurei Shrine Reitaisai" was given by ZUN himself. It first started in the year 2004 as a way for Team Shanghai Alice to publicly distribute the trial version for their upcoming games to the fans well in advance of releasing them on the internet; in addition, the 2004 Reitaisai featured a total of 114 participating circles. Since then, many Touhou derivative works are also gathered and sold there. Commencing every year in April or May, the convention has been hosted in Ōta, Tokyo in 2004; Naka-ku, Yokohama in 2005; Sunshine City, Tokyo in 2006 and 2007; and the Tokyo Big Sight in 2008 and after. The year 2010 saw the birth of Reitaisai SP, an additional Reitaisai to be held every autumn due to increasing popularity, but Reitaisai SP was canceled after 2011. The 2011 Reitaisai was originally canceled due to safety concerns after the 2011 Tōhoku earthquake and tsunami, and the release of Ten Desires was also postponed. It was later rescheduled and held on May 8, 2011, with approximately 4,940 participating circles. In addition to events in Japan, there is another Reitaisai held in Taiwan starting in 2015. ^ a b Tomohiro, Katada (2008-10-03). "ニコ動、2ちゃんねるで人気の｢東方Project｣って何だ?" [What is this Touhou Project popular on Nicovideo and 2ch?] (in Japanese). R25.jp. Archived from the original on 2013-07-29. Retrieved 2009-07-10. ^ "Most prolific fan-made shooter series". Guinness World Records. Archived from the original on April 24, 2013. Retrieved 2011-09-24. ^ Guinness World Records Gamer's Edition 2011. Guinness World Records Ltd. 2011. p. 49. ISBN 978-1-4053-6546-8. ^ Doujin Game Package Design Vol.01 (in Japanese). RebRank (a dōjin circle in Japan). 2013. p. 7. ^ ZUN (February 11, 2010). "ZUN's tweet regarding Lotus Land Story" (in Japanese). Twitter. Retrieved February 11, 2010. ^ "Tasogare Frontier's log (2007)" (in Japanese). Retrieved 2009-07-23. ^ ZUN (2008-05-01). "Touhou Project Eleventh Bullet" (in Japanese). Retrieved 2008-05-02. ^ ZUN. "Touhou Project 12 Touhou Seirensen" (in Japanese). Retrieved 2009-07-10. ^ "Touhou Hisōtensoku official website" (in Japanese). Retrieved 2009-07-23. ^ "Tasogare Frontier's log" (in Japanese). 2009-07-23. Retrieved 2009-07-23. ^ "東方Project 第12.5弾" [Touhou Project 12.5] (in Japanese). ZUN. Retrieved March 2, 2010. ^ 夏コミ情報 [NatsuComi Information] (in Japanese). ZUN. July 23, 2010. Retrieved July 24, 2010. ^ "東方Project第13弾 東方神霊廟 〜 Ten Desires" [Touhou Project 13th Game Touhou Shinreibyō ~ Ten Desires.] (in Japanese). ZUN. February 28, 2011. Retrieved February 28, 2011. ^ "東方心綺楼　～ Hopeless Masquerade" (in Japanese). Twilight Frontier. Retrieved October 5, 2012. ^ "東方Project 第14弾の情報です" [News About the 14th Game in the Touhou Project] (in Japanese). ZUN. May 11, 2013. Retrieved May 11, 2013. ^ Ramachandran, Nayan (May 1, 2015). "Touhou 14 Hits Playism on 5/7/2015". Playism. Archived from the original on 2015-05-05. ^ "弾幕アマノジャク 〜 Impossible Spell Card". Valve Corporation. Retrieved March 17, 2019. ^ "14.5th Touhou Project 東方深秘録　～ Urban Legend in Limbo" (in Japanese). Twilight Frontier. Retrieved April 11, 2015. ^ ZUN (April 22, 2015). "東方Project　第15弾です。". Retrieved April 22, 2015. ^ "東方紺珠伝 ～ Legacy of Lunatic Kingdom". Valve Corporation. Retrieved March 17, 2019. ^ "東方憑依華　～ Antinomy of Common Flowers. on Steam". store.steampowered.com. Retrieved 2017-12-21. ^ ZUN (2019-04-17). "東方Project第17弾です : 博麗幻想書譜" (in Japanese). Retrieved 2019-04-17. ^ ZUN (2007-05-14). "Touhou Bōgetsushō" (in Japanese). Retrieved 2007-05-15. ^ "Touhou Bōgetsushō official website" (in Japanese). Ichijinsha. Retrieved 2007-05-15. ^ コンプエース 2012年12月号 [Comp Ace December 2012 issue] (in Japanese). Kadokawa Shoten. Archived from the original on October 30, 2012. Retrieved October 30, 2012. ^ "Forbidden Scrollery, Vol. 1". Yen Press. Retrieved November 28, 2017. ^ "「東方外來韋編 Strange Creators of Outer World.」公式サイト" (in Japanese). ASCII Media Works. Retrieved October 2, 2015. ^ a b Perfect Memento in Strict Sense pp. 112–116 "Hakurei Reimu." ^ "Sangetsusei Part 2 Separate volume edition, volume 1, p. 129-143 "番外編 酒三杯にして……"
^ Perfect Memento in Strict Sense p. 136-137 "Human Village"
^ "Touhou Saimoe 2 official website and contest results" (in Japanese). Livedoor. Archived from the original on 2005-02-09. Retrieved 2007-01-11. ^ 東方の夜明け [Dawn of Touhou] (in Japanese). Meiji University Anime and Voice Actors Research Club. Archived from the original on 2009-03-11. Retrieved 2009-07-10. ^ Solamarle (2007-11-09). "Notes on ZUN's Genyou Denshou Lecture". Gensokyo.org. Retrieved 2009-07-10. ^ ZUN (August 2005). Bohemian Archive in Japanese Red. Ichijinsha. p. 166. ISBN 4-7580-1037-4. ^ "(同人誌と図書館)ジャンルコード別サークル数一覧（C82～C88）と夏コミ告知" (in Japanese). Myrmecoleon (Researcher at the Meiji University Yoshihiro Yonezawa Memorial Library). Retrieved December 27, 2016. "(同人誌と図書館)ジャンルコード別サークル数一覧（C85～C91）と冬コミ告知" (in Japanese). Myrmecoleon (Researcher at the Meiji University Yoshihiro Yonezawa Memorial Library). Retrieved December 27, 2016. "(同人誌と図書館)ジャンルコード別サークル数一覧（～C81）と冬コミ告知" (in Japanese). Myrmecoleon (Researcher at the Meiji University Yoshihiro Yonezawa Memorial Library). Retrieved December 27, 2016. ^ a b "Top Doujinshi Events Most Popular By The Numbers". Crunchyroll. November 1, 2013. Retrieved February 28, 2014. ^ "1000万IDの巨大サイトも創作の連鎖反応を引き起こす 音楽や映像で自由に表現" [The gigantic site of 10 million users sets off a chain reaction of creativity: The freedom of expression through music and video] (in Japanese). Weekly BCN. 2008-10-20. Retrieved 2009-07-10. ^ "Mountain of Faith: FAQ" (in Japanese). ZUN. Retrieved 2009-07-10. ^ "August Dojin Data Base" (in Japanese). Addb.jp. Archived from the original on 2011-07-22. Retrieved 2009-02-14. ^ "What is the Comic Market? February 2008" (PDF) (in Japanese). Comiket. Retrieved 2008-08-04. ^ Fujimoto, Yukari (2014). "2. Naruto as Cultural Crossroads". In Berndt, Jaqueline; Kümmerling-Meibauer, Bettina (eds.). Manga's Cultural Crossroads. Cambridge Eng. New York: Routledge. p. 188 note 27. ISBN 9781134102839. ^ "Touhou Time: The Fandom of Touhou". Gaming Hell. Archived from the original on April 20, 2013. Retrieved October 28, 2012. ^ Gann, Patrick (August 29, 2012). "Favs of Comiket: Fruited Vagabond (Review)". Original Sound Version. Retrieved October 28, 2012. Every six months, Comiket sweeps Japan, and a boatload of doujin music albums are released... You could easily spend $1000 there and still miss something cool. Especially if you’re down with all things Touhou-related. ^ "3 Fan-Made Touhou Project Games Head to PS4 as Digital Titles". Anime News Network. September 1, 2014. Retrieved September 1, 2014. ^ "【速報】『東方Project』がPS4/PS Vitaに進出!? 第1弾は『不思議の幻想郷3』『東方蒼神縁起』『東方スカイアリーナ祭』の3作品!". Dengeki Online (in Japanese). ASCII Media Works. September 1, 2014. Retrieved September 1, 2014. ^ "ZUNxPlayStationプロジェクト第一弾3タイトル発表。『東方』の同人ゲームをPS4やPS Vitaで販売". Engadget Japan (in Japanese). September 1, 2014. Archived from the original on September 2, 2014. Retrieved September 2, 2014. ^ ネット流行語大賞は｢あなたとは違うんです [Net Slang of the Year goes to 'I am different from you'] (in Japanese). ITmedia. 2008-12-02. Retrieved 2009-07-10. ^ "Valkyrie Profile, Star Ocean, And Tohou Crossover In Square Enix Arcade Game". Siliconera. September 27, 2012. Retrieved November 13, 2012. ^ "Touhou Project, Anime Tenchou Get Anime by ufotable". Anime News Network. September 24, 2010. Retrieved September 24, 2010. ^ "musoukakyo | 舞風-Maikaze" (in Japanese). Maikaze. Retrieved July 8, 2017. ^ "Touhou-Based 'The Memories of Phantasm' Anime Streamed". Anime News Network. August 16, 2011. Retrieved October 28, 2012. ^ "京都幻想剧团". Kyoto Fantasy Troupe. Retrieved June 24, 2017. ^ "幽幻天仪盘-东方旧作动画|永动之龛" (in Chinese). Perpetual Motion Niche. Retrieved June 24, 2017. ^ "2007 11th Japan Media Arts Festival Open form" (in Japanese). Japan Media Arts Plaza, Agency for Cultural Affairs. Retrieved 2007-11-19. ^ "2007 Eleventh Japan Media Arts Festival Award-winning Works". Japan Media Arts Plaza, Agency for Cultural Affairs. Retrieved February 29, 2008. ^ "Reitaisai Twitter account" (in Japanese). Twitter. March 11, 2011. Retrieved March 11, 2011. ^ "博麗神社例大祭 in 台湾" (in Japanese). 博麗神社社務所. Touhou Wiki, an unofficial wiki similar to Wikipedia with full information on the Touhou Project and anything related to it.